How many cycles can a custom coil cord handle? How long will it last? When designing a custom coil cord, we get asked questions like this all the time. Of course it depends on the coil cord and the operating environment, but we can assure you the answer is between one and a few million. All kidding aside, we’ve put together a short guide to let you know where in that range your coil cord might fall. Let’s take the low end of the range first. 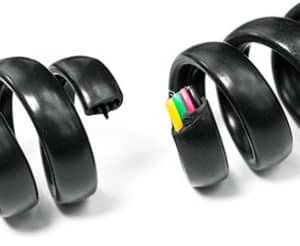 You would think a coil cord that could only handle one cycle would be useless, but there is actually a good case for creating a single-cycle product. 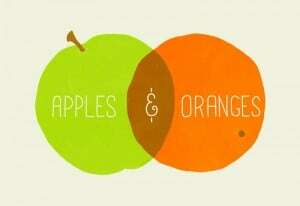 Let’s say you have a piece of equipment that comes in different sizes or configurations. The same power/control system is used on each unit, but the cables needed to connect everything need to vary by length. If you don’t want to wire everything yourself you need to buy a cable assembly for each different configuration, or you can buy one coil cord that can stretch to fit all the configurations. 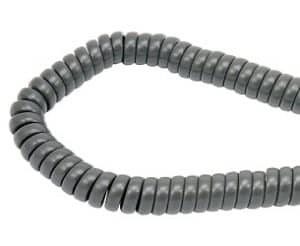 Now this coil cord doesn’t need to retract so it can be made with entirely different materials, which helps keep costs down without sacrificing electrical performance. The high side of the range is over a million cycles. At Meridian, we have several different machines we use to test the cycling capability of the custom coil cords we design and manufacture. We have tested several different designs to over one million cycles, with the highest being 1,087,213 cycles. Interestingly enough, when we recorded that number, the test was stopped not because the coil cord failed, but because we had to test other coil cords and couldn’t leave it on the machine any longer. What makes a custom coil cord last a long time? Design, fabrication, and environment. The higher the cycle count requirement, the more the design must differ— especially when it comes to materials. 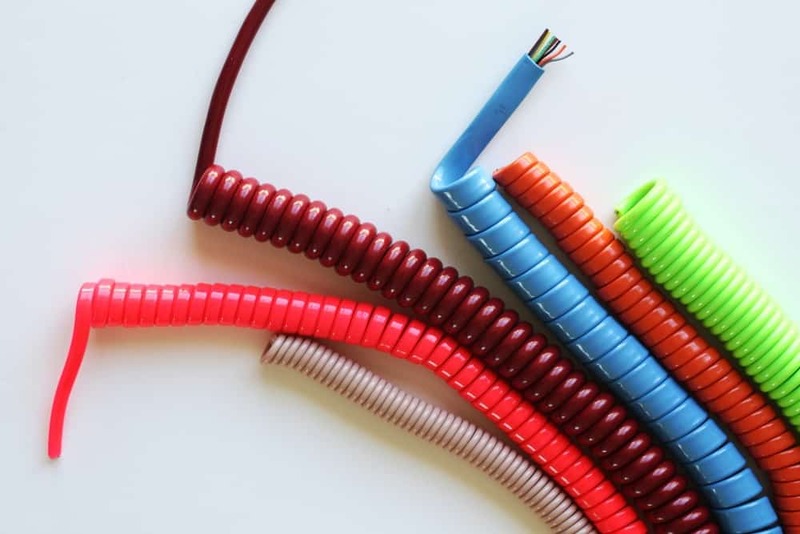 For low-cycle coil cords, the stranding diameter can be larger and the plastics can have a lower elasticity, which generally means a lower cost product. For high-cycle coil cords, the stranding needs to be very small and the plastics highly elastic. Also, the fabrication becomes very important. Not only is the custom coil cord extending and retracting, but all the components are twisting and untwisting. When cable is extruded, everything from the individual strands to the conductor bundle is twisted. 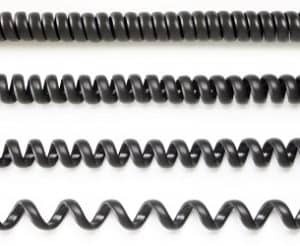 How all this twisting is done has a big impact on how the coil cord performs. Put simply, the team at Meridian Cable can design a custom coil cord that is capable of cycling as many times as you need it to. By clearly defining the needs of your equipment and environment and performing appropriate testing, we can make sure the finished product is designed to be durable. 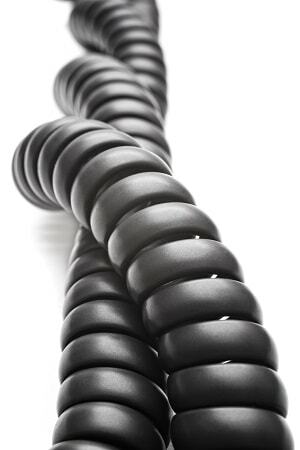 Contact us when you are ready to discuss your next custom coil cord project. Thinking through what you need before the coil cord design process starts can help you get the ideal cable for your equipment. Custom coil cord design services allow you to get a final product that is a better match for your needs than an off-the shelf wire. But if you haven’t done some serious thinking about what you really need, you might not get the results you were looking for. Here are a few questions you can ask your team to get a coil cord that is truly customized to the requirements of your equipment. In what environment will you be using the cords? One of the first questions an engineer will ask during the coil cord design process is what environmental conditions the wire will need to withstand. Obviously, a cord used in a military or industrial environment has different requirements than one that would be used in a retail setting. Other questions could include: Will the cord be used inside or outside? Does it need to be able to withstand extreme heat or cold? Will the cord come into contact with moisture or oil? These are all conditions that can and should be taken into consideration when designing coil cords. How long should the coil cords last? A coil cord that lasts forever might seem like an ideal product, but if higher durability compromises function and/or makes it prohibitively expensive to produce it may not be worth it. In addition to durable jacketing material, there are other elements that can affect longevity. 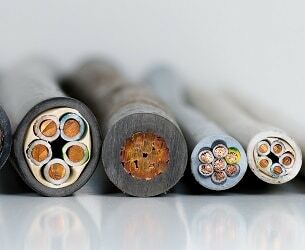 For example, choosing stranded wiring as a conductor can create a cord with a higher resistance to metal fatigue than a solid conductor. However, tinsel might be a better choice if you need flexibility but the finished wire can’t handle a high current capacity. How dynamic are the coil cords during normal function? 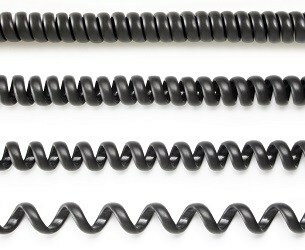 A coil cord can be designed with materials like steel, Kevlar, Spectra, or Teflon to make them virtually indestructible. That sounds great, but is that durability worth the added expense to produce for a cord that doesn’t require it? 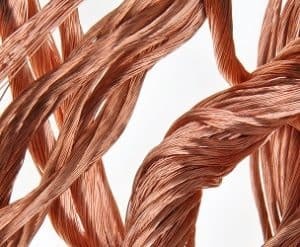 By clearly communicating your cord’s normal, everyday function, a coil cord design team can recommend materials that are the right balance of cost and physical properties for your equipment. 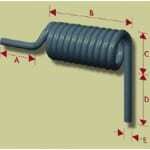 A key question will be how many extension and retraction cycles the coil cord will experience in its life. Custom coil cord design from a reputable cable manufacturer like Meridian Cable is a great way to get a cord that is perfectly tailored to your application. While there are many different elements to take into consideration when creating a custom coil cord, thinking through the questions above is a great way to prepare for initial discussions with the design team. When you are ready to discuss your project, please contact us. We look forward to hearing from you. Your guide to choosing materials for your product’s coil cords. A Coil Cord Design Product Comparison allows you to choose materials for your product when comparing coiled cords and the jacketing required for them. It’s likely that you encountered a string of acronyms and had to make sense of them to decide which one would be ideal for your product and its industrial needs. Interpreting these differences and figuring out which material will be ideal for your product and its cabling requirements can be a challenge. We understand how difficult making this decision can be, so we crafted this post to help you to decipher these differences and choose the right type of wiring for your product. Here we’ll cover some of the more common types of cabling, the industries that each are commonly used in, the best type of application for these wires, and more. SJOW indicates that the cable is a junior service cable. This type of cable can withstand up to 300 volts.The jacket will be oil resistant, which is beneficial if the product will be in a harsh work environment. This type of custom coil cord is non-permeable and ideal for environments where corrosive oils could hinder the cable’s functionality. The jacketing is also weather resistant and is rated for indoor and outdoor use. 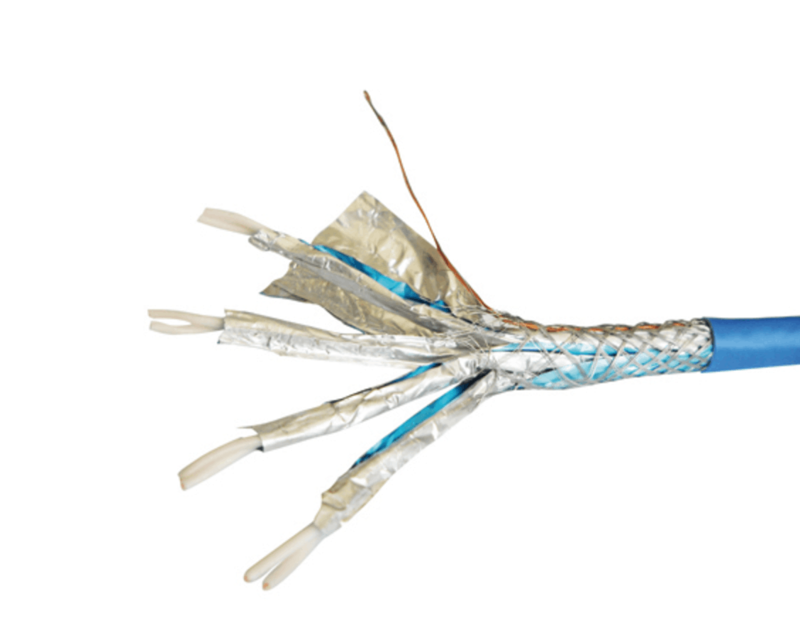 This combination of features makes this jacketing ideal for custom cable that will be used with small-scale machinery. The product’s low weight combined with its resistance to abrasions makes it ideal for use with portable products. This is a lighter duty vacuum cable and, as the name suggests, it is often used in household appliances. Up to 300 volts can be transmitted through this type of cabling though, so it is capable of handling quite a bit of power. Despite this, the product is best suited for smaller household machinery that is likely to encounter light household use. These cables are typically made of neoprene, so they can be useful for products that will encounter a broad range of temperatures. The use of neoprene means that the product is fairly resistant to UV rays and can handle everyday use. This type of thermoplastic rubber is durable and heat resistant, making it perfect for a product that will have to work effectively in a variety of temperatures. This plastic can also be colored easily, making it great for products that require a certain aesthetic. This capability is also beneficial for wiring that needs to be clearly differentiated for installation purposes. As with most plastics, this product is durable and can withstand wear and tear while remaining flexible. These are just a few of the options to discuss with your cable designer during the design and manufacturing process. Custom cabling is an extremely difficult product to manufacture as a result of the geometry, vast knowledge of manufacturing materials, understanding of cabling machinery, and more that all go into producing quality cable. Because of this level of complexity, it’s often best to have cords designed for your product rather than hoping that off-the-shelf options will be suitable. With wires, cable cords, coil cords, and other vital components of your product – it’s often best to have an experienced designer guide your team through the design, production, and manufacturing process. Does the cabling manufacturer understand your product? Having cabling custom made to your product’s specifications is an important part of the design and manufacturing process and, when designed properly, will add to the longevity and durability of your product. Does the cabling manufacturer strive to understand your product and are they excited to work with your design team to improve it? What type of jacketing will this custom cable have? There are many options available, and these coverings can be customized to accommodate virtually any scenario. An experienced cable manufacturing company will be able to consider options like Polyurethane for cabling that will be exposed to extreme temperatures, or Chlorinated Polyethylene for custom assemblies that will be exposed to abrasive materials. Will your product be exposed to extreme heat? If so, ask your manufacturer about jacketing material such as Polytetrafluoroethylene which often can withstand temperatures of 200⁰C. Does this company typically manufacture custom goods, or are they focused on producing off-the-shelf cable assemblies and wires? If your cable assembly manufacturer is not familiar with the steps involved in custom designing assemblies, issues are likely to arise down the road. 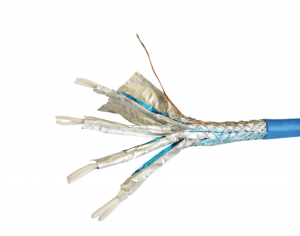 Because of the intricacies of custom cables, things can very easily go wrong – using wiring that cannot carry the proper voltage or jacketing that is not durable enough, for example, can wreak havoc on your final product. Ask potential manufacturers for examples of their work or past references to assess their quality and service throughout the production phase. These steps will give your team peace of mind when working with a cable designer. Where does the cabling manufacturer source their materials? When manufacturing cable assemblies on a large scale, it’s important to understand where your manufacturer sources their raw materials from and if this distributor is known for supplying quality goods. It’s also important to determine if the manufacturer will be designing the cable assemblies, wire, and cabling in-house or if they subcontract this work. If so, it’s important to research the subcontractor and ensure that all parties communicate openly and frequently to design a great product. What quality assurance steps is your manufacturer taking to ensure that the cabling and wiring produced are of the highest quality? These are all key properties to assess to ensure that your wiring functions properly and consistently. You can find more detailed information on testing and assessing quality assurance in this industry in our blog post on the topic. We hope that this helps you to narrow down your options when choosing a cable assembly manufacturer to work with. We know that this can be a challenge and are happy to work with our clients to ensure that they understand the entirety of the design, production, and decision-making process.